So who wants a Pontiac G3? Apparently no one. 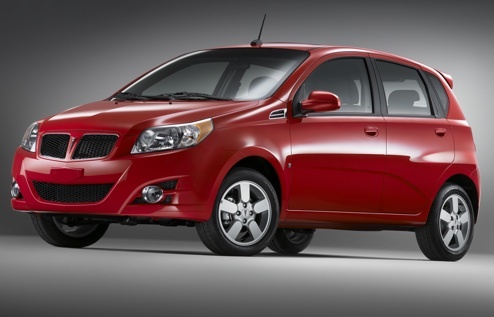 The rebadged Chevrolet Aveo (built in Korea on a GM-Daewoo platform) is not selling well. In fact, the Wall Street Journal says Pontiac has a two-year supply of G3s sitting around. Apparently, Pontiac sold an incredibly uninspiring 141 units in March. I sat in a G3 at the Portland Autoshow and the interior wasn't terrible. Granted, I haven't driven one so I can't comment. The question (with an obvious answer) is, do we really need the G3 and the Aveo? The G3 exists to satisfy a demand from dealers, not customers; plus it's only available in optioned-up form equivalent to an Aveo LT (this on a car that everyone buys the base model of since low price is its' USP). Add in that it's anyone's guess whether or not Pontiac will be thrown under the bus in two months, and you got a proble. What I take away from this is....Way To Go Nissan! Awww... that's just.. horrible! Honestly, I feel bad for the G3. It's like... I dunno... it's like seeing that one kid on the playground that's being completely avoided by all the other kids. I just feel sorry for it. And at least what I've seen on their website, it isn't that bad looking. The inside seems alright too.